A new facsimile of Fortunato Depero's 1927 monograph, Depero Futurista—also known as the Bolted Book. New facsimile, first printing, 2017. The Italian Futurist Fortunato Depero designed the Bolted Book as a kind of portable museum or calling card, a portfolio of his career to date—including paintings, sculptures, textile and architectural designs, theater and advertising work, wordplays, manifestoes, and reviews he received in many different languages. It is at the same time a showcase of his skills as a designer and typographical wizard. The book was published in 1927 in Milan by Dinamo-Azari, a collaboration between Depero and his friend the poet, aviator, and publisher Fedele Azari. Comprising 240 pages, the book is secured by two large industrial aluminum bolts that when removed allow for the pages to be removed, rearranged, or exhibited individually. A very small number of copies (thought to have been four or five) were produced with metal front and back covers for special recipients. Depero Futurista was planned to have been published in an edition of 1,000, though the number actually printed is uncertain. The copy used for this facsimile (both printings) is No. 843 and is signed by Depero on page 2. Only a small number of copies of the original book still exist, and almost all of those are in institutional collections. Two previous reproductions (1978 and 1987) have been published (also in collaboration with the Mart). They are now out of print. They were produced with some material not included in the original: various front and back matter; a table of contents; page numbers. This new facsimile includes only material that was in the original. 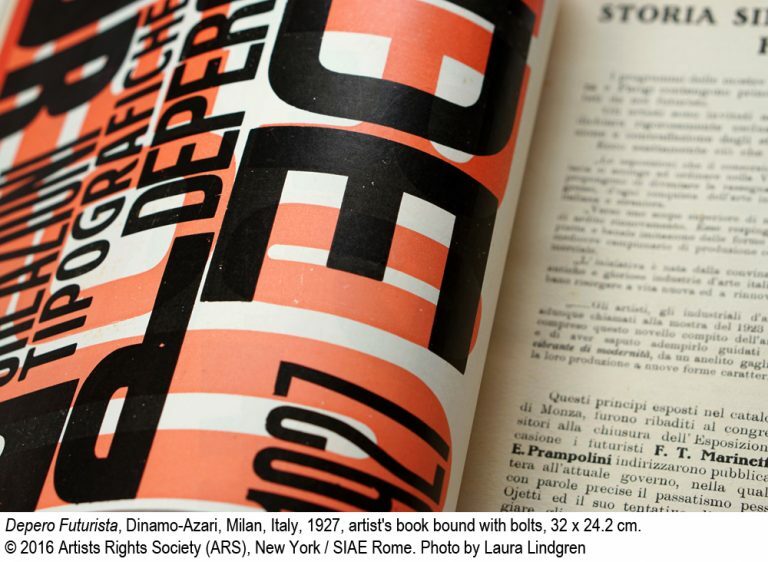 Scholarly essays and previously unpublished material from the Fortunato Depero archives at the Mart are included in a special Reader’s Guide companion volume. In an effort to be as faithful to the original as possible, the scanned artwork shows the original printing quality permutations, and these characteristic variations are not retouched. The copy used for the scans is one of three owned by Gianni Mattioli, who was one of Depero’s most important patrons and supporters, and who actively participated in the production of Depero Futurista. Why create a new facsimile of this book? Books can be important sources of inspiration for creativity. Books from the past can resonate with the present. Depero Futurista meets both criteria. Published more than 90 years ago, it anticipated the way today’s artists and designers conceive of their work and connect with the public. Depero was a multidisciplinary practitioner. As an artist, designer, and maker he was involved in painting, sculpture, architecture, fashion, graphic design, interior design, product design, set design, advertising, and magazine publishing. He pioneered the idea of artist as “cultural entrepreneur” generations before that term came into use. Depero combined high and low art, breaking down barriers between the fine arts, commercial arts, and pop culture. Depero understood and encouraged the active practice of self-promotion by artists. Depero was the only Futurist to live and work in the United States for a sustained period. Depero Futurista demonstrates his diverse art and design talents as well as his sophisticated understanding of branding, marketing, and self-promotion. Depero embraced writing in all forms—from essays and books to poetry and plays. Not only did he write and design Depero Futurista, he also wrote eight other books, including his autobiography, So I Think, So I Paint. In concept and execution, Depero Futurista is regarded as the first modern-day artist’s book and an avant-garde “book as object” masterpiece. 1892: Born in Fondo, in the province of Trentino, at that time part of the Austro-Hungarian Empire. 1906: Meets Rosetta Amadori, whom he marries in 1918. 1913: First solo exhibition, in Rovereto. Meets Filippo Tommaso Marinetti in Rome. 1914: Moves to Rome and meets Giacomo Balla. 1915: Officially admitted to the Italian Futurist movement. With Balla, publishes “Ricostruzione futurista dell' universo” (The Futurist Reconstruction of the Universe). 1919: Founds Casa d'Arte Futurista in Rovereto, designing, producing, and selling toys, tapestries, and furniture. 1928: Moves to New York. Designs restaurant interiors, costumes for stage productions, and covers for Vanity Fair, The New Yorker, and Vogue. Also does work for the New York Daily News and Macy's. 1932: Designs the bottle for Campari Soda, still in production. 1947: Second move to New York. Publishes his autobiography. 1959: Casa Depero opens, located in and funded by the town of Rovereto. Depero personally supervises every detail of the project. It remains the only museum founded by a Futurist.